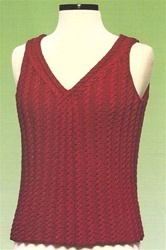 This top is worked in the round, with slight shaping at the center front and back. The center two cables twist over each other at the base of the neck, then run up alongside the neck to the shoulder straps. 11 sizes in worsted weight yarn. The gauge called for is 32 st & 33 rows = 4" in Cable pattern on US 5 needles, or 5 st/inch over stockinette. We have several yarns that would be great for this pattern. Uses worsted weight yarn, about 200 yds/100g.